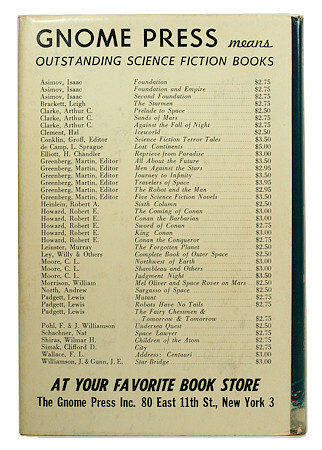 This title is one of the pinnacles of Gnome Press collecting. This was one of the books I’d resigned to the last legs of my Odyssey. 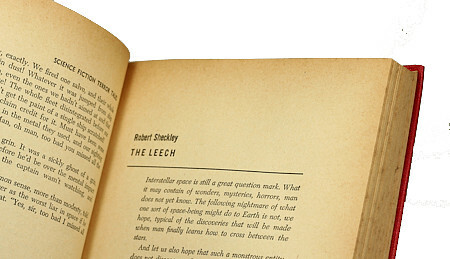 In book collection circles it seems to share the rarefied atmosphere inhabited by such titles as Asimov’s I, Robot and Foundation, Simak’s City and Against the Fall of Night from Arthur C. Clarke. 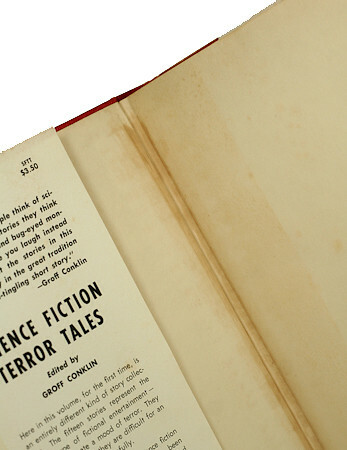 It’s certainly not the most expensive of titles – any of those mentioned in similar condition would fetch more – but urban legend has it that it’s the rarest of all the GP books. The reason, I read somewhere (and I wish I knew where exactly, I can’t for the life of me remember), is that it was a particularly popular title with libraries. Once a book hits a library it get’s stuff glued into it, stamped, taped, rebound and generally receives all manner of abuse. Hence picking up a copy in reasonable condition is a rather special occasion. So, for this special occasion, cue the golden horn wielding cherubs and garlands of wild flowers. Here we go. Not bad. Looks like some slight sunning on the spine, but otherwise pretty good. 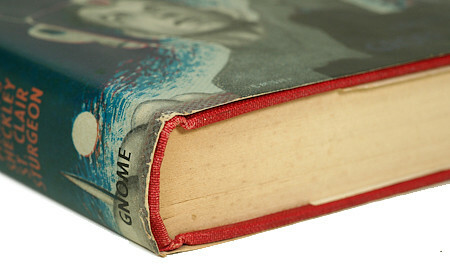 Colors are still bright and the dust jacket in general is free from any rubbing. Sans jacket it also looks sharp. Nice. No wear on the edges of the boards at all and only some slight bumping to the head and tail. Looking from the top we see a couple of problems. First, the discoloration here is quite evident and we can see some spotting. Also some creepy-crawly has had a bit of a munch on it at some stage. Thankfully though the hole only goes about a quarter inch deep. The bottom view is a little better. The edge of the block is much cleaner with less discoloration. A closer look reveals no surprises. The edge of the jacket is excellent all-round with that slight wear at the extremities of the spine. No problem. A bit of age toning inside. But nothing unusual for this vintage. Some foxing where the paste-down and front free end-paper meet, non-existent at the rear. All in all, very nice. The rear of the jacket is a continuation of the front – minimal rubbing and shelf wear, still bright too. 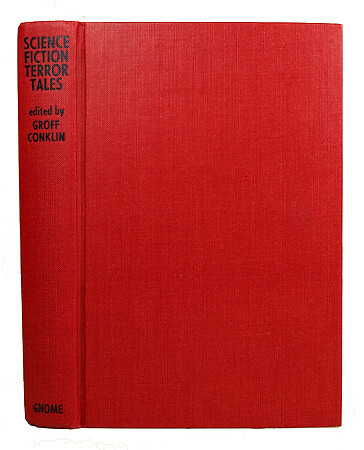 Chalker & Owings: SCIENCE FICTION TERROR TALES, edited by Groff Conklin, 1955, pp.x/ 262, $3.50. 5000 copies printed. Points: Because of the relative scarcity of this title, we were initially inclined to believe not all were bound, but have since determined that the print run is correct; Conklin had an exceptional public library status as a must-order anyway and this received a superior review from Kirkus. Reprints: Mass market pbs., Pocket Books, 1954; again, 1969. Comments: I consider myself very lucky to have a copy of this book. The condition is nice enough and a fair price for such. 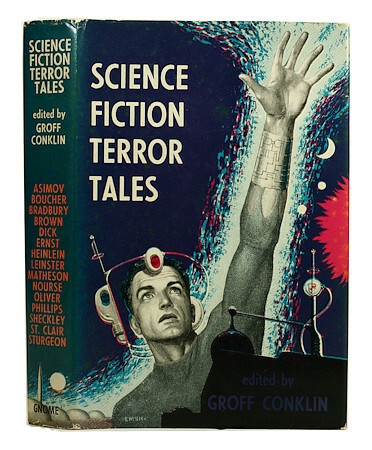 This entry was posted on August 17, 2010 at 3:28 pm and is filed under 1955, Close Up with tags Ed Emshwiller, Groff Conklin, Science Fiction Terror Tales. You can follow any responses to this entry through the RSS 2.0 feed. You can leave a response, or trackback from your own site. 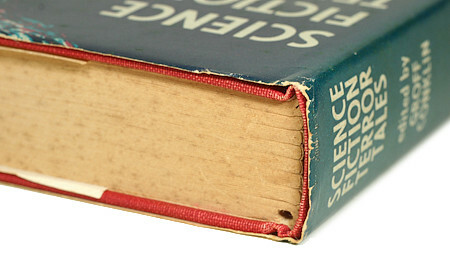 Just curious, but what do you do if the book smells bad? You know how old books stored in the garage get. I’ve got a bunch of them. Is there some way to deodorize them? I’ve never tried to remove that old book odor. I quite like that old smell, it takes me back to my childhood. Thankfully though, the books that I have so far haven’t been too bad. Try this link here, there are several options that appear to be available. The original of this cover was on ebay recently–no takers at the very healthy price offered. I YEARNED for it, man.